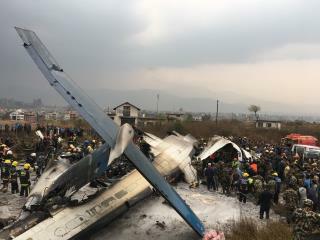 (Newser) – In August, a leaked draft of the investigation into a deadly plane crash in Nepal suggested an insult directed at the pilot may have contributed to the crash. Now, the official release of the report confirms that. Per Reuters, it states that Captain Abid Sultan, 52, "seemed to have an emotional breakdown" prior to the crash of US-Bangla Airlines flight BS211 last March at Kathmandu airport, in which 51 of the 71 people aboard died. The report described him as "very much emotionally disturbed and stressed" because a female coworker had "questioned his reputation" as a competent flight instructor; she wasn't on the flight, per the BBC. The report backed this up by saying that when communicating with ground control prior to takeoff, Sultan exhibited a vocal pitch and language indicative of high stress levels. Next on Newser: Could a Trump-Clinton Rematch Be in the Cards? Surely, you're not going to try to fly this plane. Don't call me Shirley. long story short. His ego got everyone killed.